1. 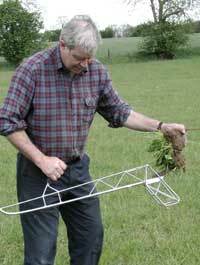 Lean the Lazy Dog frame slightly forward of vertical, and place the points of the Fork (No8) or Weeder Nose (No1b) about 6" back from the crown of the plant. Allow for a 'cushion of soil' between root and lifting fork. 2. Place your foot on the pivot and swing all your weight onto it to push the fork into the ground. Try to avoid too much stamping. 3. When the fork is in the ground, start levering the root out. You can tell from the resistance whether or not you have caught the root, so stop and re-adjust your depth or aim, as necessary. 4. With the root entangled on the fork, take hold of the lower handle and lift the plant to waist height for removal. Take hold of the plant entangled on the fork, and turn the whole tool upside down. Pull the root off the fork (which should be pointing towards you) and throw it into a pile for later collection.